thinking and living in a radically different way. Conversations with Richard Bandler recounts Owen Fitzpatrick's journey to discover the true nature of personal freedom and what is possible for the human spirit. Through his conversations with his mentor, Richard Bandler, and drawing on his own personal and professional adventures across the world, he takes you on a thought-provoking voyage of discovery. Today, many have become trapped in fear, anxiety, loneliness, depression, heartbreak, rejection, and perfectionism. After thirty-five years of helping people transform their lives and become free from their problems, Richard Bandler has the answers. 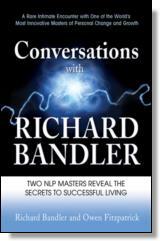 Conversations with Richard Bandler is packed with exercises designed to help you change, as well as to make you happier, more relaxed, confident, and successful. You'll also gain fascinating insights into love and spirituality, as well as Richard's philosophies on life and the human experience. Richard Bandler's books have sold more than a half a million copies worldwide. Tens of thousands of people, many of them therapists, have studied his blend of hypnosis, linguistics and precise thinking in the United States, Europe, and Australia. Bandler is the author of Using Your Brain—for a Change, Time for a Change, Magic in Action, and the Structure of Magic. He coauthored Frogs into Princes, Persuasion Engineering, The Structure of Magic II, and Magic in Practice. Owen Fitzpatrick is a psychologist, hypnotherapist, coach, and cofounder of the Irish Institute of NLP and the youngest licensed NLP master trainer. Fitzpatrick has helped thousands of people with a wide range of problems and is one of Europe's top motivational speakers. He is the host expert on a primetime Irish television show, Not Enough Hours. Visit www.owenfitzpatrick.com.